Plascore cleanroom ceiling panels are ideally suited for use as blank panels where lights and filters are not required in the ceiling system. Utilizing the same quality construction as the Plascore cleanroom walls, Plascore ceiling panels can either be walkable* or non-walkable. Walkable* ceiling panels are built custom to the customers specific written specification for point load, deflection, thickness, and surface requirement. Non-walkable ceiling panels utilize the standard panel configuration in the thickness and surface requirement required to fit your grid. Both walkable* and non-walkable panels can be built to allow for penetrations to accommodate sprinkler drops, ion emitters and similar devices often utilized in a cleanoom ceiling application. * All walkable panels are built to the customer’s specific written requirement. Plascore makes no claim to any of its panels being walkable, but rather that they meet the written specification for which they have been built. 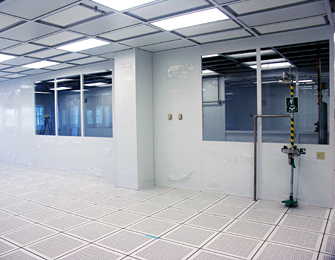 Plascore cleanroom panels can also be used to create a wide range of plenum barriers. This is accomplished by simply attaching the cleanroom panels directly to the interior structure of the plenum or by using one of the Plascore wall systems. The advantages of utilizing Plascore panels and wall systems to build plenum barriers are numerous. For example, no custom fabrication or “oil can” effect as with traditional sheet metal plenums and increased productivity, due to the fact that the walls and the plenum barriers are constructed of the same materials, reduces the learning curve during installation. Plascore walkable modular panel ceiling system allows for a plenum cap with minimal joints yet is flexible enough for penetrations where necessary. Support rods can be transferred from the structure above to the ceiling grid below without the needs for through holes.